백송은 나무껍질이 넓은 조각으로 벗겨져서 흰빛이 되므로 백송 또는 백골송(白骨松)이라고도 한다. 중국이 원산지로서 조선시대에 중국을 왕래하던 사신들이 가져다 심은 것이다. 송포의 백송은 나이가 약 250살 정도로 추정되며, 높이 11.5m, 가슴높이 둘레 2.39m이다. 나무의 모습은 옆에서 보면 부채살처럼 퍼져 역삼각형으로 보이며, 다른 백송에 비해 나무껍질이 희지 않은 편이다. 이 나무의 유래는 두 가지로 알려져 있다. 하나는 조선 선조(재위 1567∼1608) 때 유하겸이라는 사람이 중국의 사절로부터 백송 두 그루를 받아, 그 가운데 한 그루를 이 마을에 살고 있던 최상규(송포 백송의 소유자)의 조상에게 준 것을 묘지 주변에 심은 것이 크게 자란 것이라는 것이고, 다른 하나는 조선 세종(재위 1418∼1450) 때 김종서가 6진을 개척할 당시 그곳에서 근무하던 최수원 장군이 고향에 오는 길에 가져다 심은 것이라고 전해진다. 마을 사람들은 중국에서 온 나무라고 하여 한동안 이 나무를 당송(唐松)이라 부르기도 하였다. 백송은 흔히 볼 수 없는 희귀한 소나무이며, 중국과의 문화교류를 알려주는 나무로 역사적·문화적 자료로서의 가치가 높아 천연기념물로 지정·보호하고 있다. 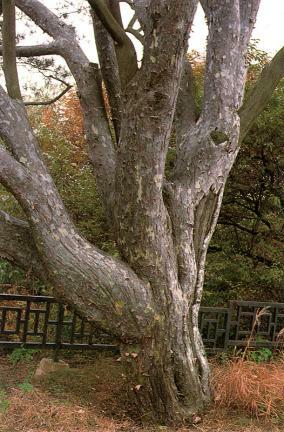 The lacebark pine is also known as the "white pine" or "white bone pine" because its bark comes off, leaving the tree trunk white. The species was introduced to Korea by Chinese envoys during the Joseon dynasty. 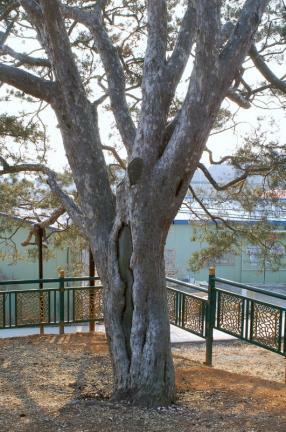 This lacebark pine in Songpo is about 250 years old. It is about 11.5m tall and has as a girth of 2.39m, and stands at the entrance to the village. 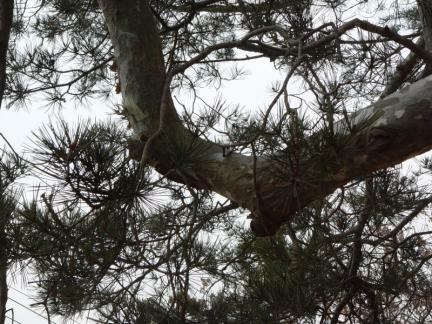 Seen from the side, this tree resembles an upturned triangle because its branches are spread like the ribs of a fan. The bark of this Lacebark Pine is not relatively whiter than other white pines. There are two stories about the tree. 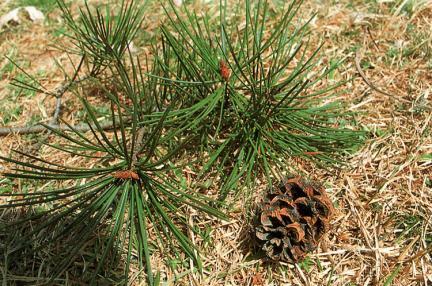 According to one, Yu Ha-gyeom received two lacebark pines from Chinese envoys during the reign of King Seonjo (r. 1567-1608) of the Joseon Dynasty, whereupon an ancestor of the Choe family (Choe Sang-gyu is the present owner of the Lacebark Pine) living in the village planted one of them at the village cemetery, where it eventually grew into a large tree. 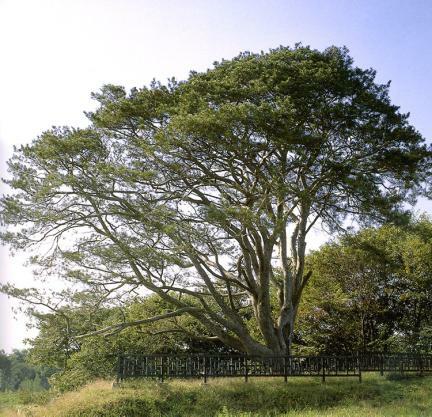 According to the other story, Choe Su-won, a Joseon general, stayed at one of the six fortresses built by Kim Jong-seo during the reign of King Sejong (r. 1418-1450) and planted the lacebark pine there. The villagers named this tree the "Tang pine" because it had been introduced from China. 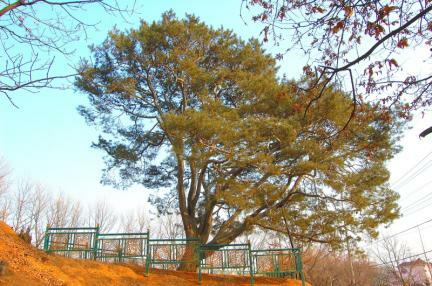 The lacebark pine in Songpo, Goyang is a rare tree that has been preserved for many years, making it an important material for historical studies. It has been designated as Natural Monument (No. 60).